Dr. Tina has only one four-legged companion, but she has more than enough love to give. Mabel, a Boston Terrier, was born on March 11, 2010. Imagine how cute she was! She’s a sweet friend who gets along very well with Dr. Tina’s kids, Lea and Ashlyn. “She’s always excited to see people and is always looking for belly rubs,” Dr. Tina says. Dr. Tina has always had a soft spot for dogs. 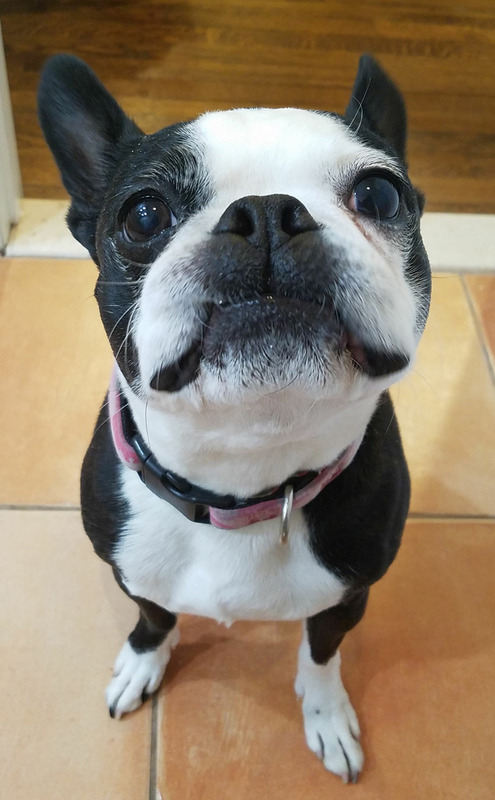 She chose a Boston Terrier because of its energy level, temperament, and ideal size. They grow 15-17 inches tall and only weigh 10-25 pounds. Mabel is like an Olympic sprinter, running as fast as she can after tennis balls, squirrels … you name it! Dr. Tina likes throwing tennis balls to her and when she races with the kids. They like to hang out – with Mabel resting in her lap. It was the first dog breed in the USA. They used to be bred as rodent hunters and fighting dogs. For nearly 40 years, the Boston Terrier has been the official State dog of Massachusetts. It was given the nickname “the American gentleman” because it looks like it’s wearing a tuxedo. The late US president Gerald Ford owned two Boston Terriers named Fleck and Spot. Celebrity owners include Rose McGowen, Allison Sweeny, and Denise Richards. We all love dogs! When you’re in next, tell us about yours! And don’t forget to bring in a picture!